MY GUITAR STUDENTS love Angus. He's more than the store dog - he's a destination, a plan, something to look forward to every week. I am fond of Angus and of course he's a momma's boy, though sometimes I think he's a little bleep who half listens. But to my many students, and their parents, Angus is king and can do no wrong. They sit outside the lesson room on the couches and play and play and play with the dog, and have a great time. We have people who bring stuff in for Angus. Who cares about the store owners? They merely keep the doors open so Angus has a place to hang. I have a ukulele student from Hannibal, a high school student, and it's not unusual for both her mom and dad to come with her for her lesson. Hmmm ... both parents, all the way from Hannibal? Really? Well, if you could see her father fawning over Angus and taking Snapchat videos of him, you'd know why he really likes to be here. Angus and his newest chasing toy. Yesterday one of my newer students brought a large green ball for Angus. He loves this thing. He's chasing it around as we speak. It fits in his mouth and is kind of nerf-like, so we can throw it around the store for him to chase. It's amazing Angus has never crashed into a guitar or instrument while going after his ball. "If it hits one of your guitars, it might actually knock it back into tune," Angus woofs, rolling his Corgi/Cattle Dog eyes. Now this ball is nice, and probably not cheap, and it certainly shows how much my student, her little brother and her mother all like Angus. But this ball tends to get icky quickly (Icky Quickly would be a great name for a band) and the Angus Slobber (another great band name) makes it kind of gross to pick up and throw. Angus couldn't care less. "Throw the dang thing," he just woofed at me. 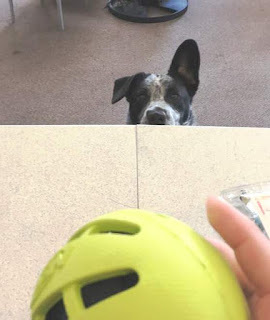 "Your student thought highly enough of me to bring me an awesome new ball and it's your job to throw it. Don't screw it up or break a window. Now!" There he goes. I've resumed typing, after washing my hands. Again. So Angus is happy and is finally resting after playing for about 90 minutes. His little legs will only propel him so far and for so long, you know, though he keeps up on our long morning walks and seems to have boundless energy. Play ball, Angus! Even if it is icky and gross. My students and parents love you, for sure.